Quantum & Woody is a thoroughly enjoyable book that offers a slightly cracked take on superheroes. The title characters are all sorts of dysfunctional, with one being more upright and the other content on his back, passed out. Still, their exploits make for some fantastic reading and Valiant is visiting that well again in publishing Q2: The Return of Quatum and Woody #1 on October 15. Oh, and it just so happens to be the reunion of legendary creators Christopher Priest and M.D. Bright. Set in the original series continuity, 20 years on from Quantum and Woody's last adventure, Q2 marks the beginning of an all-new chapter for one of the most acclaimed series and creative teams of the last two decades. "As a longtime Quantum and Woody fan, this project is a dream come true, as is diving into the material and working with these amazingly talented creators," said series editor Alejandro Arbona. "Getting in all-new scripts and all-new art of the new adventures of Eric Henderson and Woody Van Chelton is surreal. 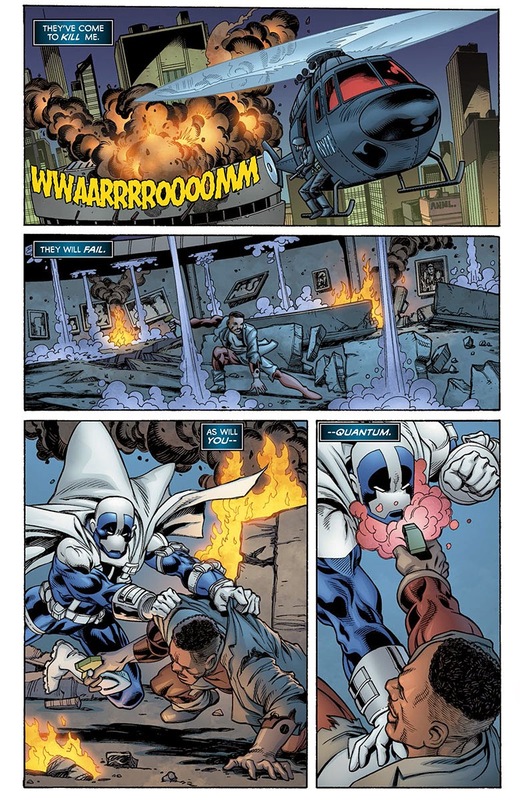 Quantum and Woody are back!" As a bonus for Quantum and Woody fans, The Complete Quantum and Woody Classic Omnibus will collect the entire original run for the first time ever. 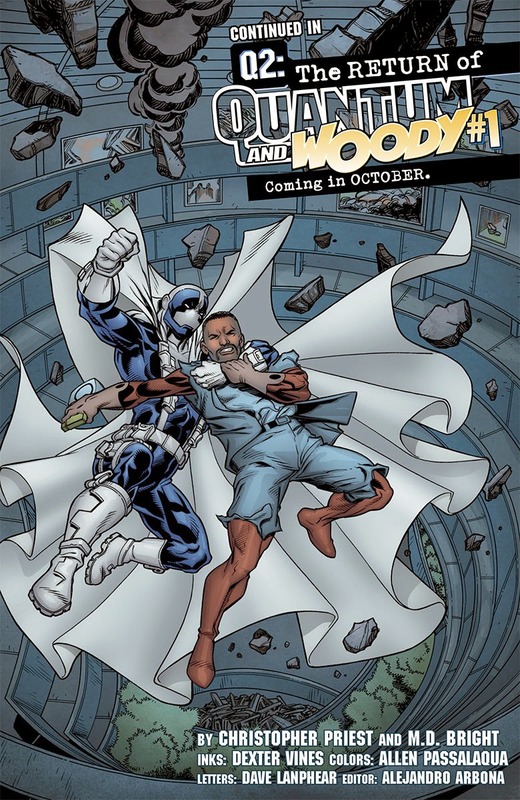 As the first in a new line of oversized hardcover omnibuses, the book will collect Quantum and Woody #0-21/#32 (1997), The Goat: H.A.E.D.U.S. #1 and X-O Manowar #6 (1996). Additionally, it will also feature the original backup stories from the Quantum and Woody trade paperback collections, and the never-before-collected story "Thunk" – plus a wealth of rarely seen sketches, character design, process art and promotional materials. The most demanded return in comics finally arrives this October! 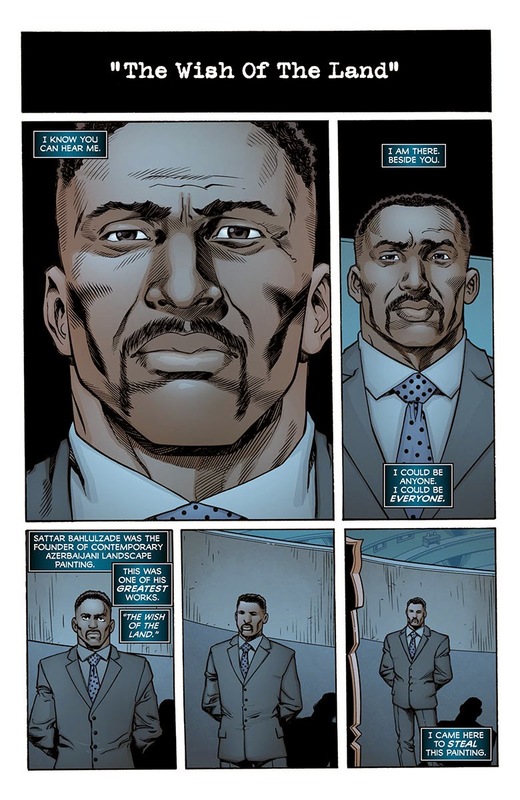 Valiant is proud to announce the release of Q2: THE RETURN OF QUANTUM AND WOODY #1 (of 5) on October 15th – the FIRST ISSUE of an all-new new mini-series reuniting legendary creators Christopher Priest (Black Panther, Deadpool) and M.D. 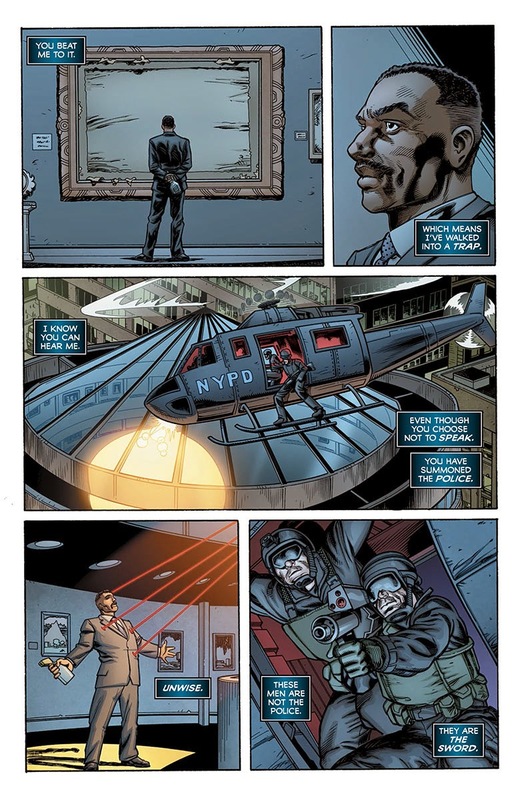 Bright (Green Lantern, Iron Man) with the world's worst superhero team! Set in the original series continuity, 20 years on from Quantum and Woody's last adventure, Q2 marks the beginning of an all-new chapter for one of the most acclaimed series and creative teams of the last two decades. Find out when the world's worst superhero team strikes back on October 15th in Q2: THE RETURN OF QUANTUM AND WOODY #1 (of 5)! 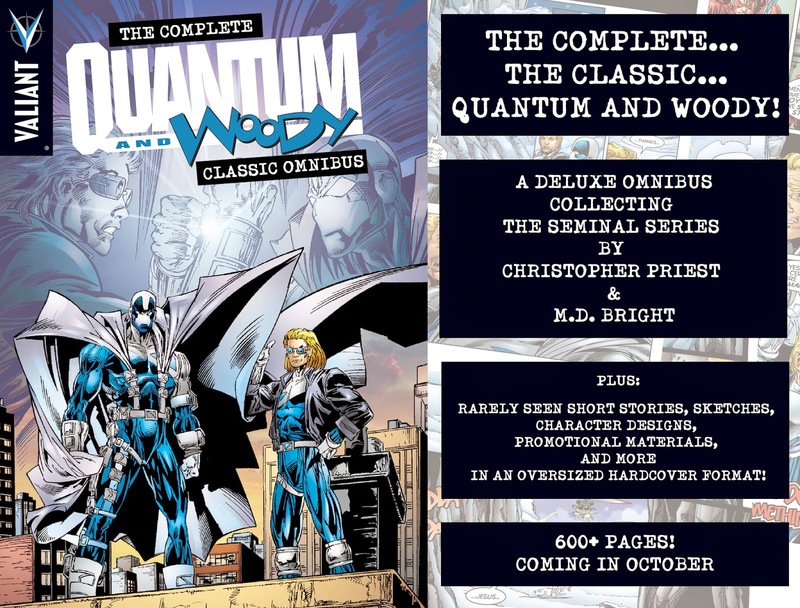 Also hitting stores alongside Q2's first issue on October 15th, Priest and Bright's seminal run on Quantum and Woody's original series will be collected in its entirety for the first time anywhere in THE COMPLETE QUANTUM AND WOODY CLASSIC OMNIBUS! 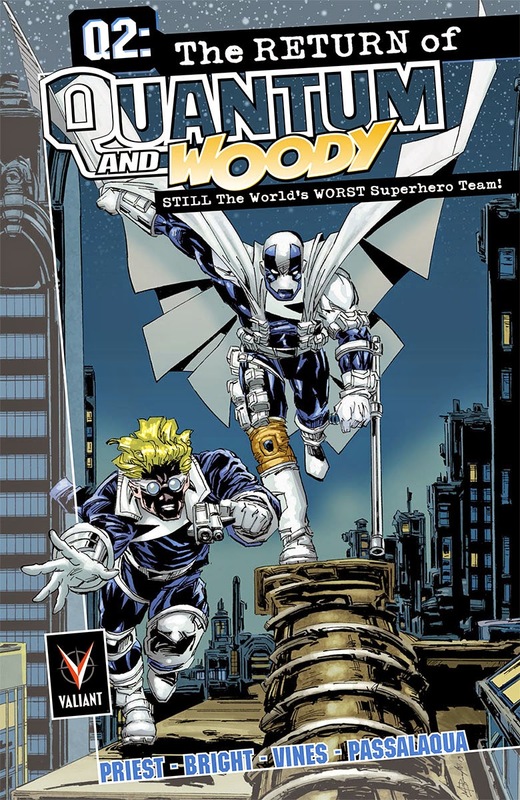 The first in a new line of oversized hardcover omnibuses re-presenting the most demanded series and runs from the Valiant archives, THE COMPLETE QUANTUM AND WOODY CLASSIC OMNIBUS hardcover will collect QUANTUM AND WOODY (1997) #0–21 and #32, THE GOAT: H.A.E.D.U.S. #1, and X-O MANOWAR (1996) #16 (guest-starring Quantum and Woody), the original backup stories from the QUANTUM AND WOODY trade paperback collections, and the never-before-collected story "Thunk" – plus a wealth of rarely seen sketches, character design, process art and promotional materials!